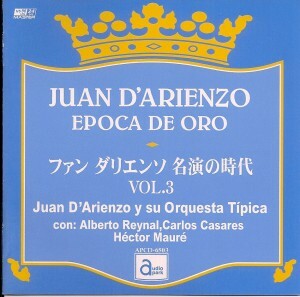 “Juan D’Arienzo Epoca de Oro” is so far my favourite D’Arienzo CD series. It is issued in Japan under the label Audio Park (the label is not specialized in tango), and it contains 11 CDs. The producer of this series is Mr. Yasuhiko Fukukawa (福川正彦). He is a fan and expert of D’Arienzo, owning all the D’Arienzo records in their original formats – SPs and LPs. He selected the significant pieces of D’Arienzo from different periods, restored them and put them together under the series “Epoca de Oro”. One of his main objectives is to preserve the original sound quality of the SPs, so that listeners can experience the pleasure of listening to original albums of D’Arienzo. Thus the music was carefully restored with minimum clean-up, and the original speed of the records were respected. The songs in this series are selected from around 500 recordings between 1935 to 1957, as Mr. Fukukawa believed this is the best period of D’Arienzo. In the pamphlet of each CD, he explained his reasons of selection and the significance of each piece of music. With Mr. Fukukawa’s guidance one can have a better understanding of D’Arienzo’s music and the change of style throughout his musical career, only that all the description is in Japanese. The series contains many well known and popular pieces, however there are also pieces we never heard of but excellent for dancing, like Por Que Razon (1939), Dos Guitas (1939), Loca (1942), Nueve de Julio (1950) etc. As CTA’s D’Arienzo series is almost out of print, Epoca de Oro is a good alternative to get some rare pieces. To view the cover art and track listings of this series, please go to this page. 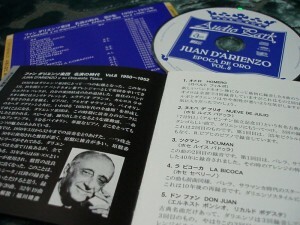 Cover art of Juan D'Arienzo Epoca de Oro CD. CD pamphlet, CD and backsleeve. This entry was posted	on Sunday, October 4th, 2009 at 8:35 pm	and is filed under Music. You can follow any responses to this entry through the RSS 2.0 feed. You can leave a response, or trackback from your own site. Is this series still available and available for online purchase? I think it’s still available. 2 years back I used to see the series at Yamano Music Store (銀座山野樂器). This shop has online shopping, even though they might not have the series in their online store, maybe you can send an email to them and ask if you can order them. Mr. Yasuhiko Fukukawa is great even in music. I LOVE HIM!